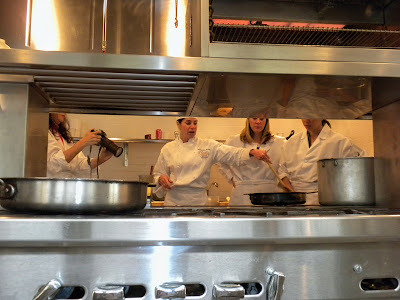 When I blogged about my trip to Napa Valley I mentioned how me and three other bloggers had the opportunity to cook at the Culinary Institute of America. Our task was to cook up some Bush's Bean Chili recipes and then have a chili tasting. It was such an amazing and fun experience all rolled up in one. First off I was introduced to a few new chili dishes that are far from the traditional Texas Chili. These recipes were more on the Southwestern Side. I have to say I really loved all the recipes that we prepared that day. But I think my favorite was the one my partner Aggie from Aggie's Kitchen and I got to prepare. The recipe I am talking about is Bush's White Bean Chili Verde with Sonoma Pesto (pictured above). One of my favorite beans is the cannellini beans so it was no surprise that I rated this recipe so high. Plus I am a lover of Salsa Verde, so this was perfect. Well, today I am finally posting the recipe that we prepared while at the CIA. I cant wait to make this dish for my family and friends. It's all I have been talking about since I returned home. Our day started with Chef Andy and Connie telling us a little bit about the Culinary Institute of America Kitchen and all the benefits and versatility of beans. One thing I learned was most people don’t think of beans as a vegetable, but they are! And they aren't just any vegetable - beans are a nutrient-rich powerhouse. Beans have more fiber and protein than any other vegetable. Chef Andy, Connie and the folks from Bush's really got me syked about beans. I was so excited to come home and try out so many different recipes on my family. Before we got started in the kitchen we were fitted with aprons. 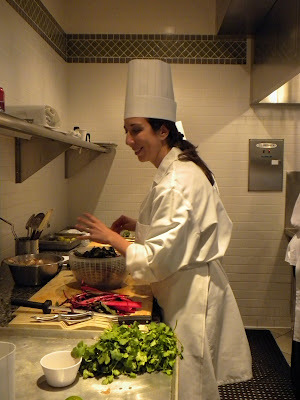 After that we received our recipes to prepare along with all of the ingredients and then the fun began!!!!!! Chef Andy and Connie showed us several different ways to roast the peppers, onions and tomatillos. When you roast the peppers and onions they take on a whole different yummy flavor. Then the beans came into the picture. 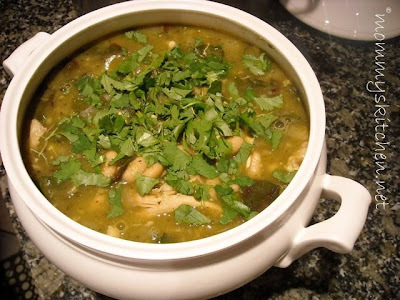 The White Bean Chili Verde utilized white cannellini beans. But from the photo above you can see Bush's has a wide variety of beans to choose from so the possibilities are endless. Here is Aggie preparing the chard. This was the first time that both of us had ever used it. What is Chard you ask? Well it is relative to beets. Swiss chard has brilliant green leaves and bright white or colored stalks. Chard is also related to spinach and has a slightly bitter, salty flavor. Since my day in the CIA kitchen I recently found some Chard at Lowe's. I was so excited when I found it that I purchased some to plant in our vegetable garden along with Poblano Peppers and Tomatillos. I cant wait until it all grows in. Connie showed us so many things when we were preparing the white bean chili verde. The tip I remember the most is how Connie showed us how to fry the sauce for the chili verde. What she meant by frying the sauce was to cook down the roasted pepper and tomatillo puree until the sauce pulls away from the sides of the pan. You can hear the sauce sizzling as it cooks. Cooking the sauce in this manner enhances the flavor and helps thicken up the mixture, see above. Chef Andy doesn't waste anything, he showed us how to use the stems of the chard for a wonderful garnish. I don't remember exactly what was in it, but I will be asking Chef Andy for the recipe. I am sure it was a little of this and a little of that. This recipe is really easy to prepare and a different spin on the traditional Texas Chili. Because of this recipe I am now a Pesto lover and cant seem to get enough of it. If you're looking for a great chili recipe that isn't spicy then this is the one. Plus it's kid rated so maybe your picky eaters might even give it a chance. This recipe was created for BUSH’S® Beans by Connie Guttersen, R.D., Ph.D., nutrition instructor at The Culinary Institute of America, mom and author of “The Sonoma Diet.” Also pictured is Connie's children. 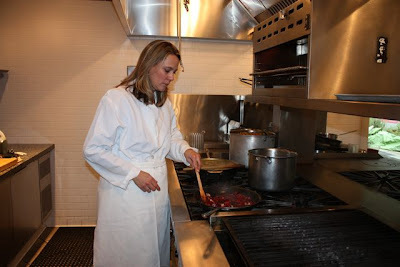 They got to visit the CIA Kitchen and cook with all of us. Connie is a mom just like us and has some of the same challenges as most moms on getting kids to eat their vegetables. Connie said her kids loved this recipe. I cant wait to try it out on my kids. To help moms serve their kids more great-tasting vegetable dishes that the entire family will enjoy, Bush's Beans invited thousands of families across the country to prepare and rate new bean recipes. Moms scored recipes on taste, ease to make and uniqueness. And kids told us which recipes were “super good!” Visit Bean's the Vegetable with More to find out how each recipe was rated. The best part is that the kids rated all the recipes. I am a firm believer that if you let children help out and be a part of the preparation and cooking process. They are that much more likely to eat what they helped prepare. This is the same concept with rating process. Click here and join the Bush's Beans Mom and Kids Panel. I just signed my family up. Enjoy today's recipe. Preheat oven or toaster oven to 400F. Place tomatillos, poblano chiles and (serrano chili if making the pesto) on sheet pan. Roast in oven until peppers have blistered and tomatillos are soft. Remove from oven. Place tomatillos in blender. Once poblanos are cool enough to handle, remove seeds and skins. Add to blender, blend until smooth. . Heat olive oil in a sauté pan. Add onions, cook until caramelized, approximately 5 minutes. Add garlic and oregano, cook until aromatic. Add tomatillo mixture, cook for 10 minutes until slightly thickened. Add stock, beans and their liquid. Bring to a simmer, cook for 20 minutes. Add cilantro, chicken and chard. Bring to a simmer, cook for 10 minutes. Adjust seasoning with salt and pepper. Serve with the Sonoma Pestso, Sour Cream or Greek Yogurt and purchased Salsa Verde. Combine all pesto ingredients in a blender. Blend until smooth. Adjust seasoning with salt and pepper. 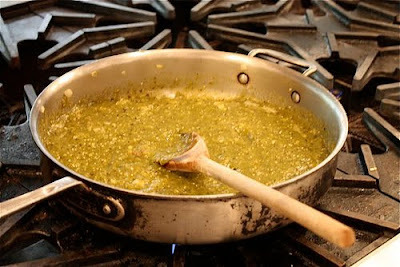 Drizzle the pesto on top of the chile verde and finish with salsa verde, as desired. Disclosure: Bush's Beans covered all my costs on my trip to Napa Valley. I am under no obligation to write this post. The opinions stated are entirely my own and I have not been compensated to publish positive comments. I'm just a big fan of Bush's Beans. Don't miss a single recipe from Mommy's Kitchen. Become a Email Subscriber. Click here to sign up. My husband is LOVING this soup! This recipe is just what I need! The flavors sound delicious together! We planted tomatillos in our garden last year and I canned tons of it so this will give me another recipe I can use them for. Thanks for posting. This is a wonderful recipe. I will definitely be making this one. I love your blog!